Football is a competitive activity that, depending on how vigorously you play, can result in moderate to long intensity throughout a session. The more physically you play football, the greater the need to monitor your diabetes is. 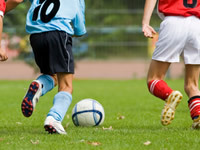 Playing once every so often will not require drastic management, but regular players will need a plan in place to keep their blood sugar levels stable. Positions on the pitch are a factor to acknowledge for footballers with diabetes. Playing in goal will not see you be as active as a midfielder, for example, who is required to work much harder and cover more ground. Gary Mabbutt, formerly of Tottenham Hotspur, has type 1 diabetes and became the most famous footballer in the United Kingdom who has the condition. Mabbutt retired in 1998 as a UEFA Cup and FA Cup winner. Danny McGrain and Andy Penman are other retired footballers who have diabetes, while Scott Allan, a Scottish midfielder with type 1 diabetes, currently plays for Hibernian. Managing your diabetes will initially be dependent on what time of the day you are scheduled to play football. Short sprints can stimulate glucagon release which raises blood glucose levels. Therefore, if your activity in the game consists mainly of short sprints with a low level of activity in between, it is possible to finish a half of football with higher blood glucose levels than at the start of the half. This effect can vary from person to person. Some positions, such as midfielders, are more likely to be moving throughout the game and are more likely to experience a steady reduction in blood sugar levels through the game. The risk of hypoglycemia during or following football can be minimised by reducing your prior basal dose. This could be from the night before or in the morning before your match. Ideally, it is best to play football at least two-three hours after your last quick acting insulin dose to prevent the risk of hypoglycemia. However, if this is not possible, then a reduction in insulin is likely to be required with a meal within two or three hours of a game, particularly if you are to be active for much of the match. If your blood sugar falls during the game, some form of glucose or snack should be consumed to boost your blood sugar back up. Blood sugars should then be tested before the match, during half time and after the match - this will help you gauge how your blood sugars trend. You will also need to ensure your sugar levels are high enough to sustain you through the half. Getting the balance right can take time and you’ll need to accept and account for the fact that some games will involve more or less activity than others. Scott Allan of Hibernian told Diabetes.co.uk: “I stopped taking chocolate bars before games as whenever I was running around the pitch later in games it caused me to cramp because my blood sugar was going too high. For me, it’s just around having a blood sugar of between 4-6 mmol/l before playing and I would take insulin without even having sugar. This is to compensate for the adrenaline rush and playing in front of the fans. You should remember to take special care of your feet when exercising. Your choice of football boots should be comfortable throughout. Playing regular football will require consistent foot care. Football is a contact game and wearing an insulin pump is not advised for this sport. For more information on wearing an insulin pump during sport, you can visit our page on exercising with an insulin pump. What does the Diabetes Forum say? Members of the Diabetes Forum have previously discussed issues with their diabetes when playing football. One user, Liamo, wrote: “Hi, I have just joined the forum. Just wondering has anyone experienced the same as me. I play football for a club and my problem is trying to have a good blood sugar range while playing without the worry of a hypo. If I start with a blood sugar between 6 and 7 I'll have bags of energy and feel good. However the chances of going hypo are high”. Above all, if you are the parent of a child taking part in sport, be encouraging, because sport and exercise are one of the keys to successful diabetes treatment.